It is a shame that all of the longer treks were forbidden while I was there and I hope that the warring in that region ends soon, but the fact that Hsipaw was still one of my favourite places has got to mean something. The town itself was my favourite town in the whole of Burma, and there were many little attractions nearby which make great day-tripping opportunities. 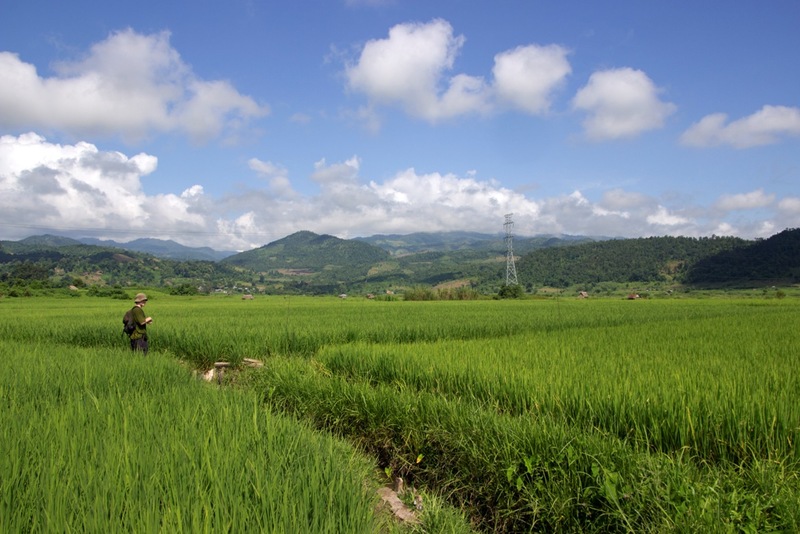 The surrounding scenery of rice paddies, mountains, farms and Shan villages are, quite simply, stunning. Visitors should also try and make time for visiting Fern at the Shan Palace for a history lesson. Okay, so we got scammed by the Singh brothers when we booked the trek, but we managed to turn it around and still have a wonderful experience. 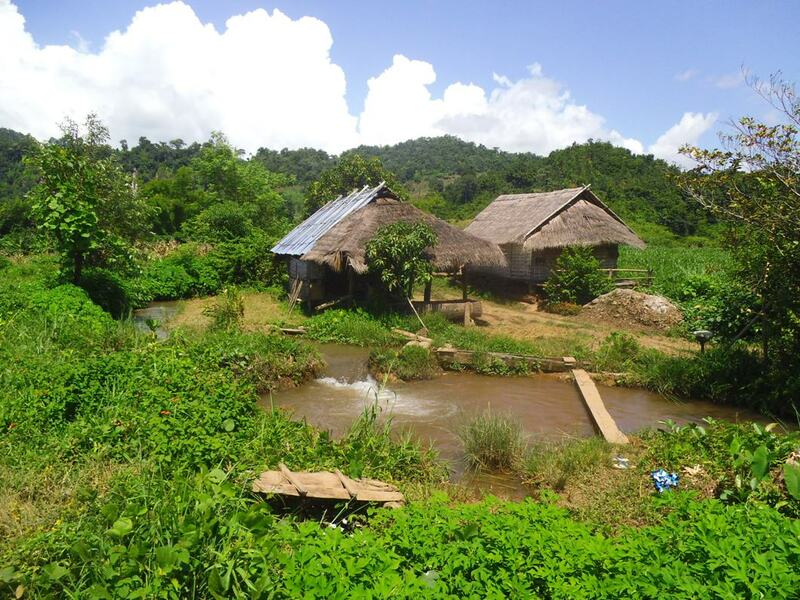 Three days of walking through a landscape of picturesque Shan hills and tribal villages is a great way to reach Inle lake, and the nicely cool climate is also a bonus. 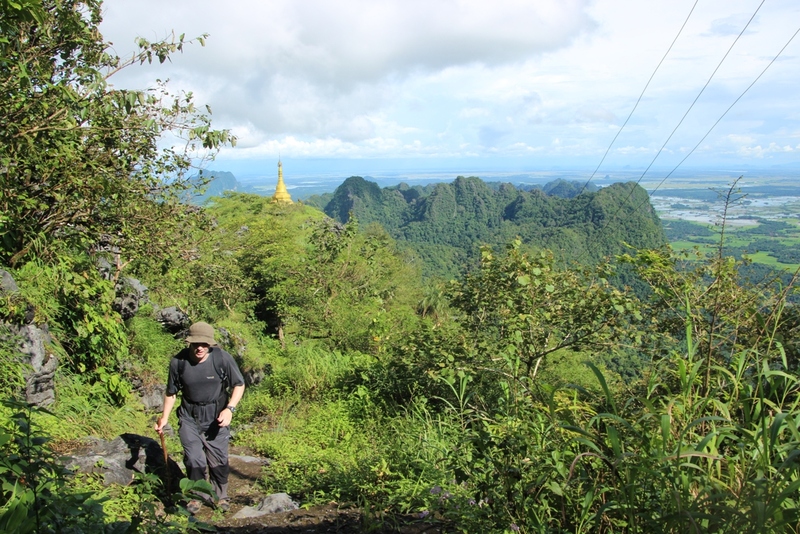 It was a sweat-inducing, exhausting climb, and the mosquitoes feasted on me that night when I slept at the monastery, but, Burma has many holy mountains, and this has got to be my favourite one. Not many people seem to go there either. 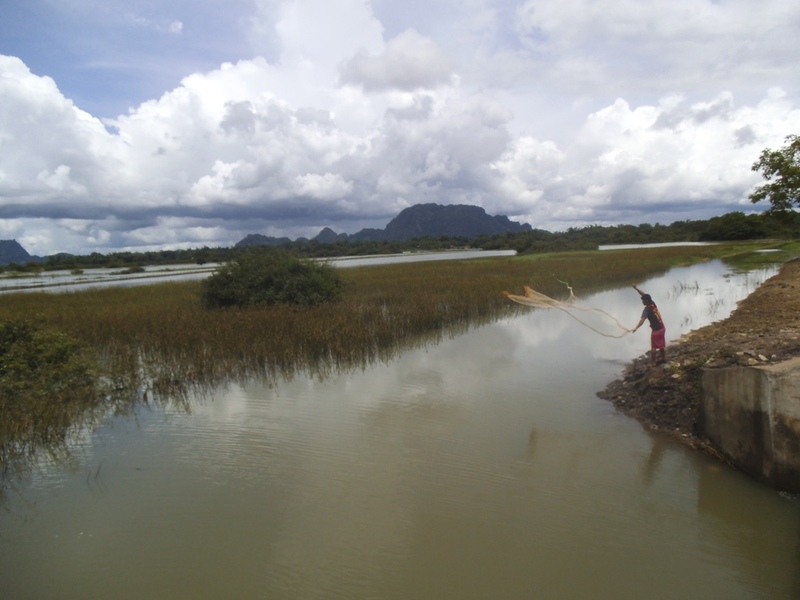 The areas around Mawlamyine and Hpa-an, where we spent our first week in Burma, still have this rawness about them which make them very rewarding for travellers. Many of the locals there are still excited to see foreigners and are keen to converse with them. Hitchhiking was easy (and often necessary, as there wasn’t much public transport) because the people were so friendly and helpful. This is definitely an area which is yet to become jaded by tourism. You’ll begin to understand. I think that visiting Burma without going to Bagan would be a bit like going to Cambodia and not seeing Angkor Wat – it’s just not done! Is basically free. Whenever you are having breakfast in a teahouse, dinner in a Myanmar restaurant, or just a quick spot of lunch in a café, you’ll often have a pot of hot Chinese tea and a few small cups placed in front of you. You can drink as much of it as you want and they just keep filling it up again! Are possibly the friendliest in Asia. 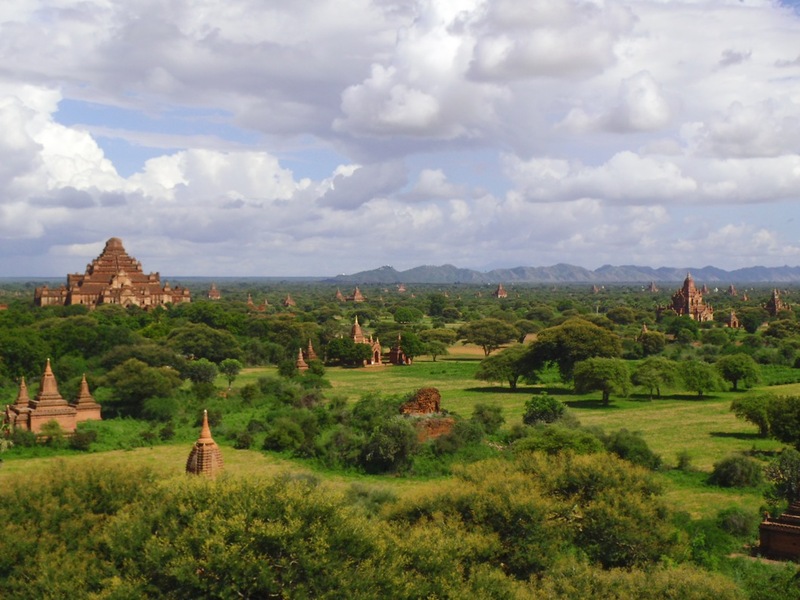 I spoke of this in more detail in my Bagan blog, but Burmese people are still in a place where they are generally enthusiastic about having foreigners visit them because they didn’t have much of a connection to the outside world before. So, when they approach you; don’t worry! They’re probably not trying to scam you, they just want to talk! Whether it was a bumpy train ride to Hsipaw, seeing beautiful villages while walking to a cave temple, being driven through scenes of rural life along the Shan plateau, or maybe even just listening to some old man’s life story while hitchhiking in his truck, one of the things that I have definitely noticed about Burma is that the journey there was often just as interesting as the destination itself. But overall, my favourite thing about Burma is that there is still much more to explore. It is a big country and there are parts of it which are currently inaccessible because of in-fighting and lack of public transport. It is also a country which is evolving, due to both its slow journey into democratisation and the coming of outside influences such as tourism. There are jungles which are home to species which are extinct in the rest of Asia, and I hope very much that they are turned into a national parks before corporate interests tear them down. 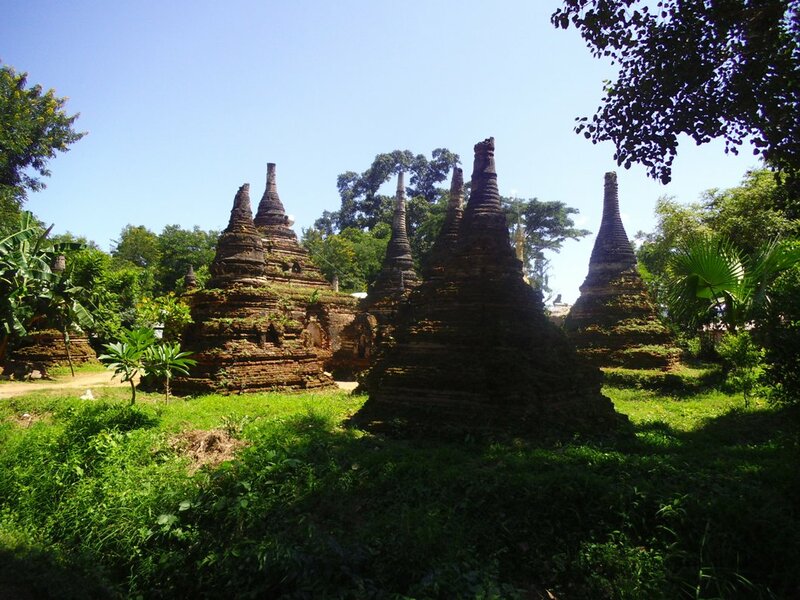 There is Mrauk U; another temple complex which is supposed to rival Bagan, but at the moment it is expensive to get to. There are islands in the south which are probably even more beautiful than Thailand’s because they are still untouched. Mandalay was a bit “meh”, but we had suspected as much. 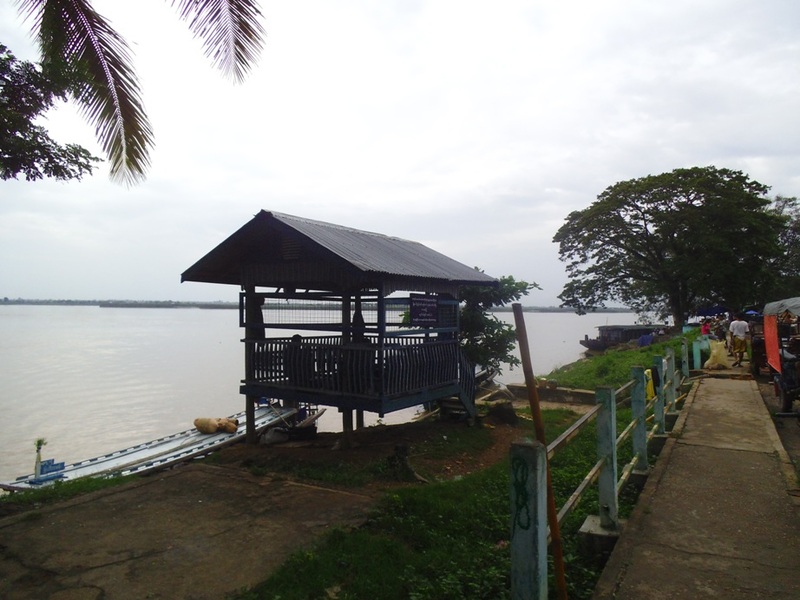 We had already decided that it was a place we were just going to pass through so as soon as we arrived there we went straight to the jetty and booked a boat heading upriver for the following morning. This still left us with an afternoon to entertain ourselves in Mandalay. So, what did we do? We caught a bus out of Mandalay. 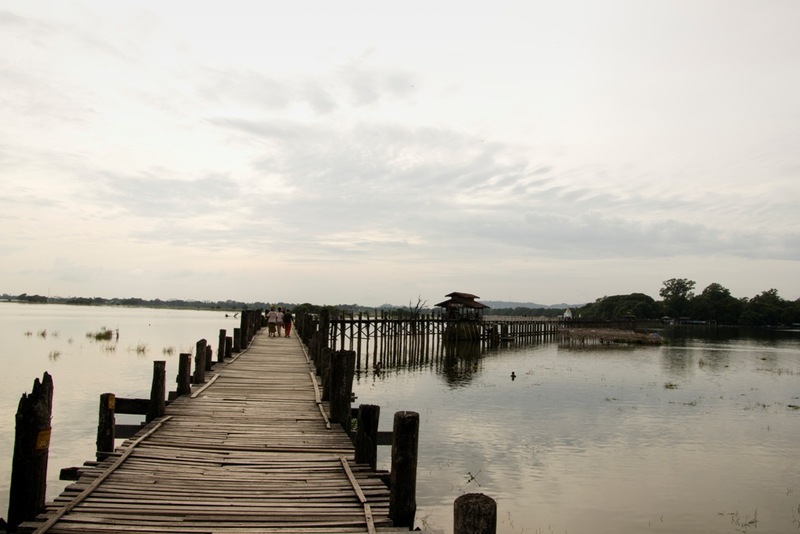 To a town just outside of it called Amarapura, so we could see the famous U Bein bridge. 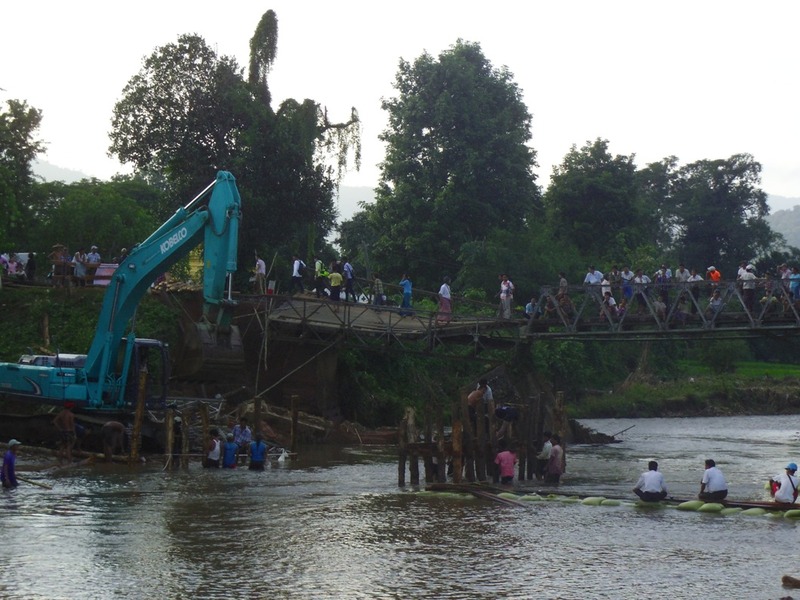 At 1.2 kilometres long, it is the longest teak bridge in the world. I happened to notice though that a section in the middle of it is actually made from concrete, which I think is technically cheating. It was nice to sit there for a while and watch local life at Taungthaman lake roll by, with the fishermen out on the water and children playing. The next morning we got up at 5 am and boarded the boat to Katha. It was quite an enjoyable journey, at first. 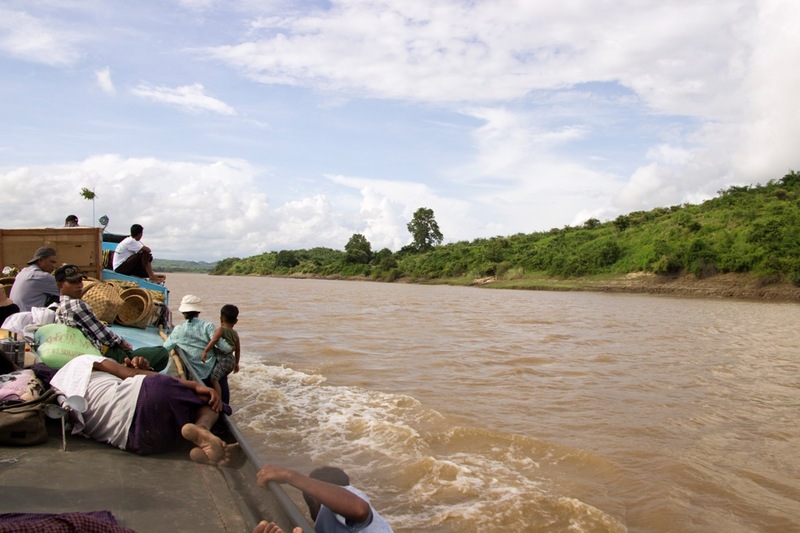 The wooden seats were a bit crammed and uncomfortable, but the scenery around the Irrawaddy river was pleasant. 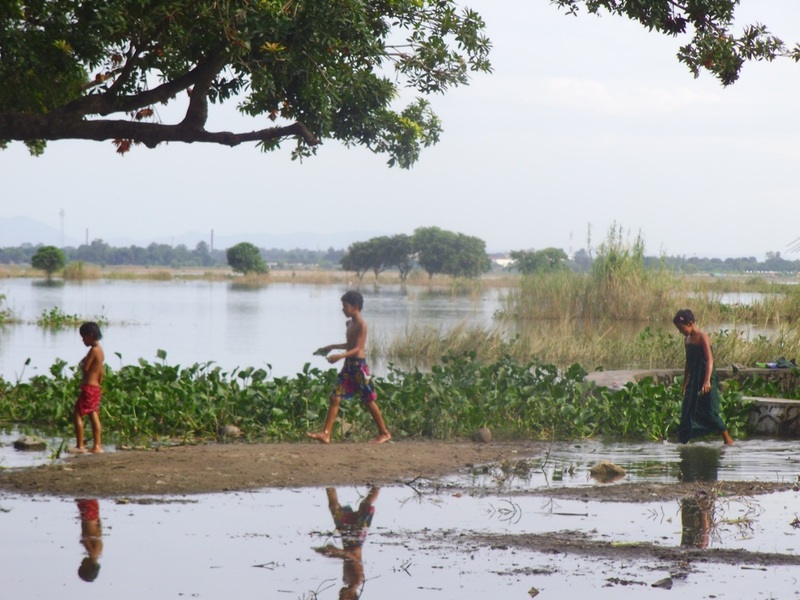 We were expecting the boat to be a bit late – we were in Burma, after all – so, when the woman who sold us the tickets told us we would arrive in Katha by 9pm, we took it with a pinch of salt. We thought that it probably meant we would be there by around 10pm, or maybe even 11 or 12. We were not at all prepared for the idea that we wouldn’t be arriving into Katha until 5am the next morning. And by that point we were very tired. Weary, frustrated, and sore from the hard seats we had just spent 24 hours sat upon, we were feeling a bit fed up by the time we found a guest house and crashed into our beds. 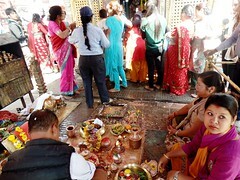 We slept for a few hours, washed, and then began to explore Katha later that morning. It was quite a nice place, and we ended up staying there for two days. There wasn’t anything incredible to see in Katha; it was just quiet river town at the end of the day. But it was a nice place to kick back and relax for a while, and the locals were all very welcoming and friendly. 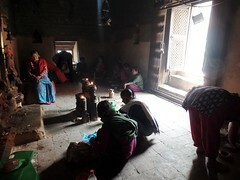 The entire time we were there there was no electricity. When we asked how long this power cut had been going on for they would just shrug and say; “Five days? I think….” and you could tell from the way they said it so nonchalantly that it this was a regular occurrence for them. 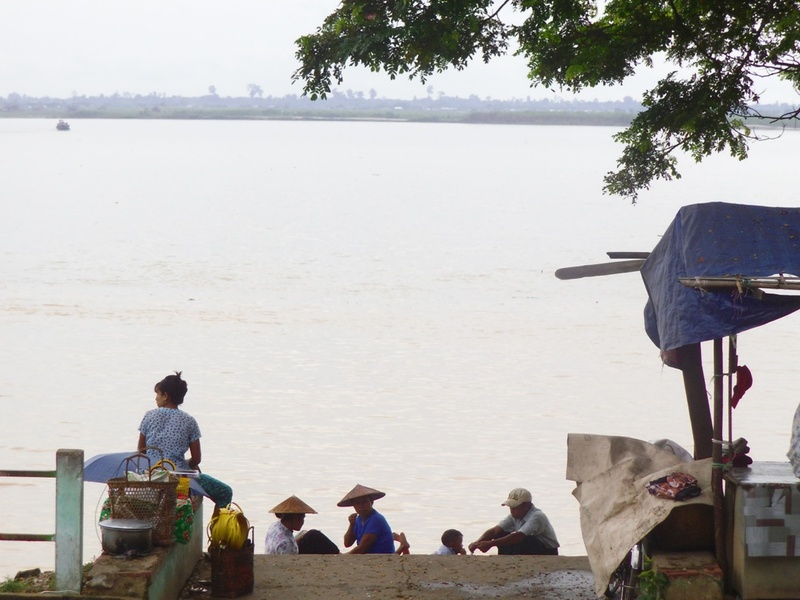 When we were beginning to think about moving on we noticed that there was a ticket booth by the side of the river, selling seats for boat running back downstream to Mandalay. “Why is it so expensive?” we asked when they told us the price. It was the same amount we paid two days ago for the hideous journey we took upstream, and we knew by then that it was a complete rip-off. That is exactly what they said to us two days ago… and there was no way we were going to fall for that trick again. So instead we caught the sleeper bus. It was half the price, took half the time, and turned out to be a bit of an adventure in itself. 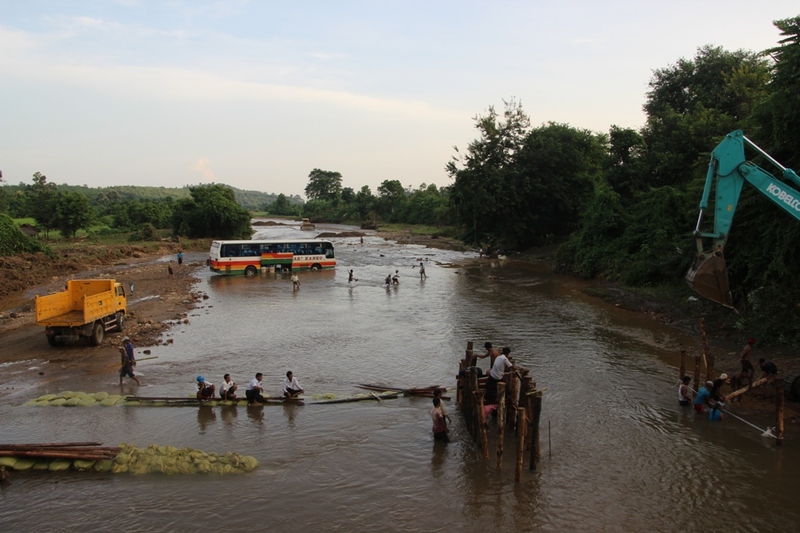 Half an hour after leaving Katha the bus reached this little obstacle, and all passengers were asked to exit the vehicle so that they could cross the bridge by foot. Thinking that there was obviously going to be a new bus waiting for us on the other side, I began to pack away my things, but, by the time I had finished filling my bag I realised that I was the only one still on the bus. Apart from the driver who had started up the engine again. “Wait!” I said, rushing down the aisle. The driver turned, and his eyes widened when he realised that there was someone still on the bus. After a moment of consideration, he then shrugged, gestured for me to sit back down, and carried on driving. A little confused, I did as he requested. He then began to drive towards the river. Meanwhile… Roy was outside, on the bridge. He was a little confused as to how I managed get away with staying on the bus during this manoeuvre. Apparently, when he saw what the bus was about to attempt (with me on it, no less) he was a little bit concerned, but this didn’t stop him taking lots of photos. We spent the next day in Mandalay again while we were waited for another bus to take us down to Yangon. 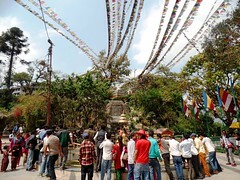 We visited many of the main sites this time, including Mahamuni Paya and Mandalay Hill. Both were nice, but I have seen grander temples and holier mountains with much more stunning views, in other parts of Burma. I left Mandalay that evening, still not quite understanding why it is one of the countries’ main tourist attractions– apart from that it is, maybe, just a convenient enough location for travel agents to throw it into package tours. 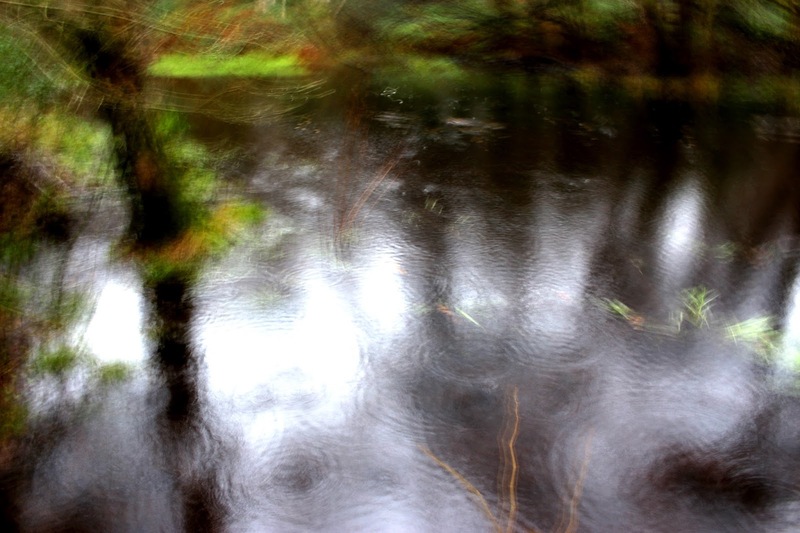 That night on the sleeper bus, I began to feel a bit ill and I thought I had a bit of a temperature, but I told myself it was probably just tiredness. Roy and I had travelled over 800 miles in the space of four days, after all, and most of it had been overnight. The next morning, shortly after we checked into a guesthouse in Yangon, I was aching all over and I began to feel feverish. I realised then that I really was ill. I went to reception and asked to upgrade to a room with a double bed and air conditioning, and they were very helpful and understanding. They even, in my weakened state, helped me move my things. I spent most of that day in bed, but I couldn’t sleep. Every time I closed my eyes I was getting those weird dreams you get when your feverish. 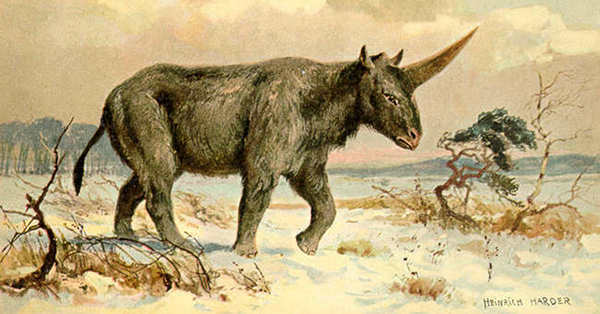 Eventually, Roy returned with some food, medicine, and a thermometer. I took my temperature and it was 39 degrees, which was slightly worrying but nothing to panic about. I had already looked up the symptoms for malaria and dengue, and I didn’t have enough of the signs for either of them to cause immediate concern. I was also coughing and sneezing a lot which was more of an indication that I had the flu. I made a resolution though: if I began to get cold sweats, pain behind my eyes, or my temperature went up to 40, I would go straight to the hospital. Luckily none of those ever happened. I must have somehow got to sleep eventually, as well, because I woke up the following morning at 4am, feeling better. I took my temperature again; 38. I managed to make it out of the hotel to eat breakfast and dinner that day, but I was still too weak to venture out too far. It wasn’t until my third day there that I finally got to see some of Yangon, and that was our last day in Burma. We caught the circular train, which took us on a rickey and bumpy ride around the city. We got off three hours later on the eastern side and took a little walk around Kandawgyi Lake before we went to see Chaukhtatgyi Temple, which was home to one of the more charming large Buddha statues that had seen of late. 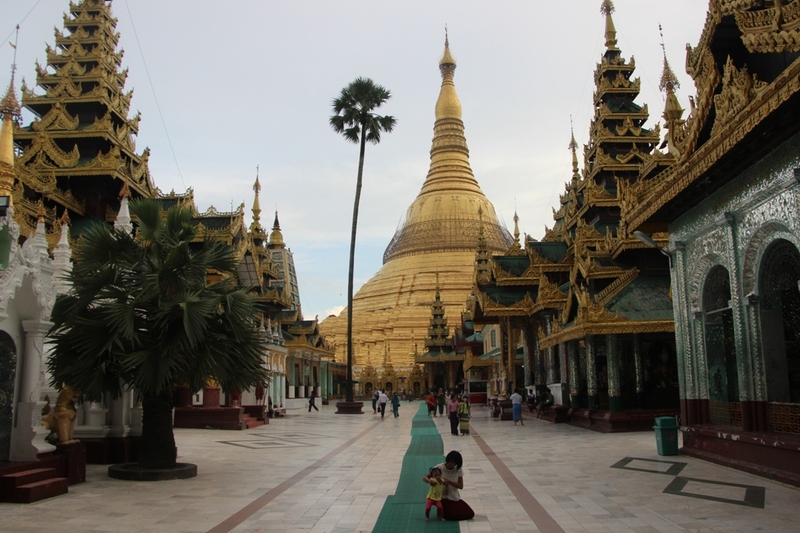 We then tried to get in Shwedagon Paya, but we found out that the Government had hiked the foreigner entrance fee up to $8 and we thought that was a bit in bad taste, as it is supposed to be a religious site, so, we walked around it and searched for way to sneak in. We managed to slip in through one of the side entrances, but the ticket Nazis eventually found us and we were escorted from the premises. So, we went back to downtown Yangon and ate an Indian thali, and when we were suitably stuffed we began to make our way back to our hotel. I saw a white guy walking down the street. 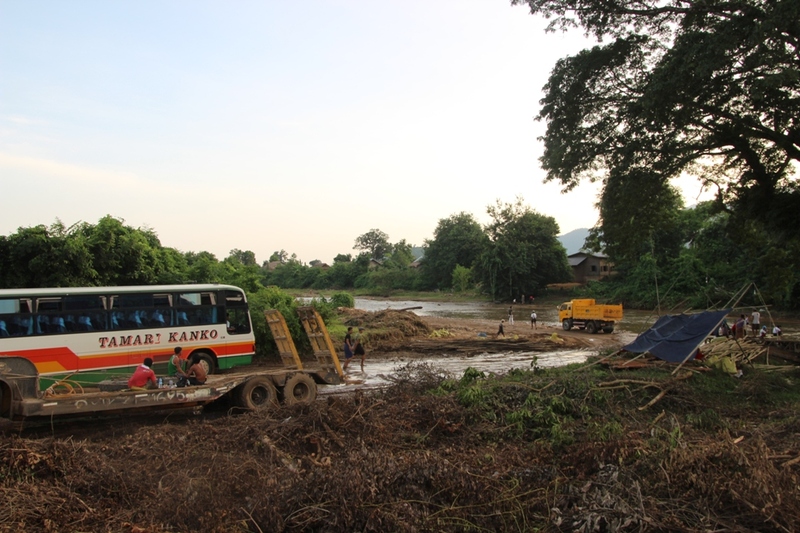 We visited Hsipaw with the intension of venturing out on a trek from there but upon our arrival we found out that all excursions which ventured too far from the town had been strictly forbidden, due to current conflicts between the Myanmar army and Shan rebels. I happened to notice that the guesthouse we were staying in had recently gone to the trouble of having a brand new sign professionally made, politely apologising for the fact that they were no longer allowed to rent out motorcycles to foreigners – which said to me that they weren’t expecting any kind of resolution to the situation soon. Fortunately, there were more than enough attractions close to the town itself to keep us occupied for a few days. 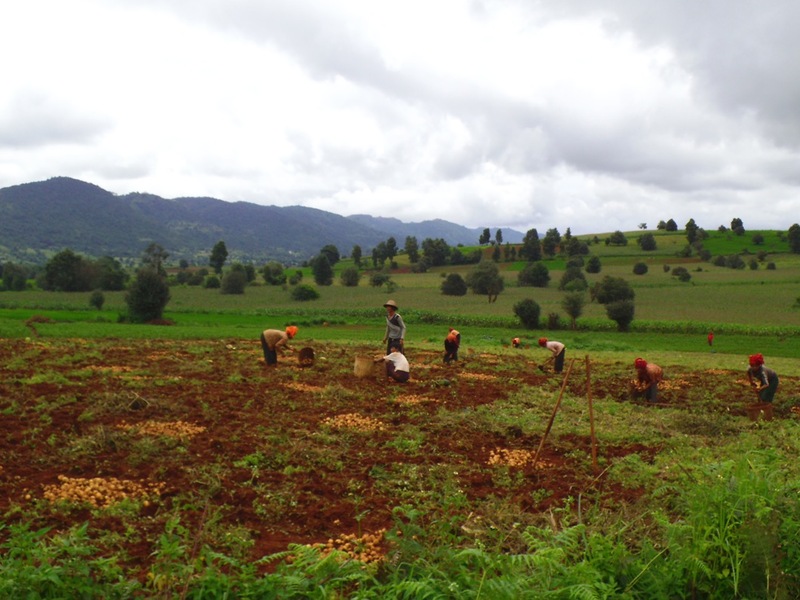 Well – we probably could have seen them in two, in truth, but we liked Hsipaw so much that we lingered there for a while. Hsipaw is very much how you imagined a Burmese mountain town to be like when you were daydreaming about your trip to Burma, and in a good way. Thriving markets outnumber shops, buffalos wander the streets, and groups of young nuns walk to and fro, holding up umbrellas to shield their faces from the sun. The roadsides were dominated by massive trees – it seemed that the town had been built around them rather than over them. Some of them are dedicated to the nats and been converted into shrines. 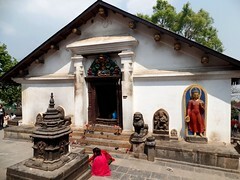 In fact, there were many nat shrines in Hsipaw. There was even a Nat Garden. Which was a blessing, as Roy and I were beginning to feel a bit bored of Buddhas, four weeks into our trip. 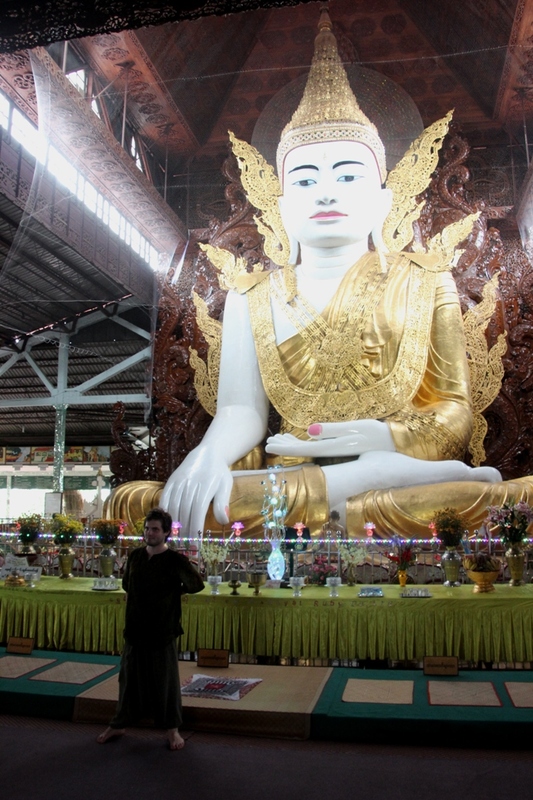 If there is one thing there is plenty of in Burma, it is certainly Buddhas. The Nat Gardens were also near “Little Bagan” which, while not anywhere near as impressive as the real Bagan, was a pleasant place to sit and eat lunch. 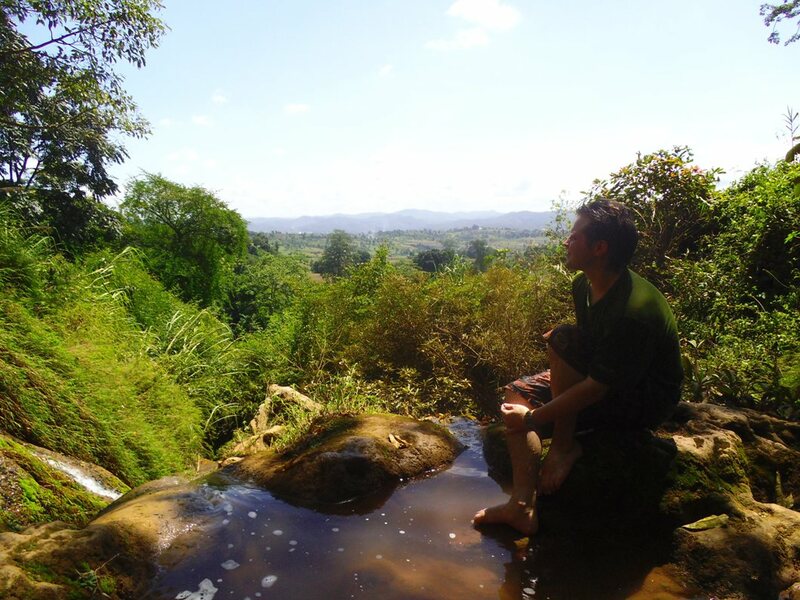 On our second day in Hsipaw we went on a little trek to a local waterfall. 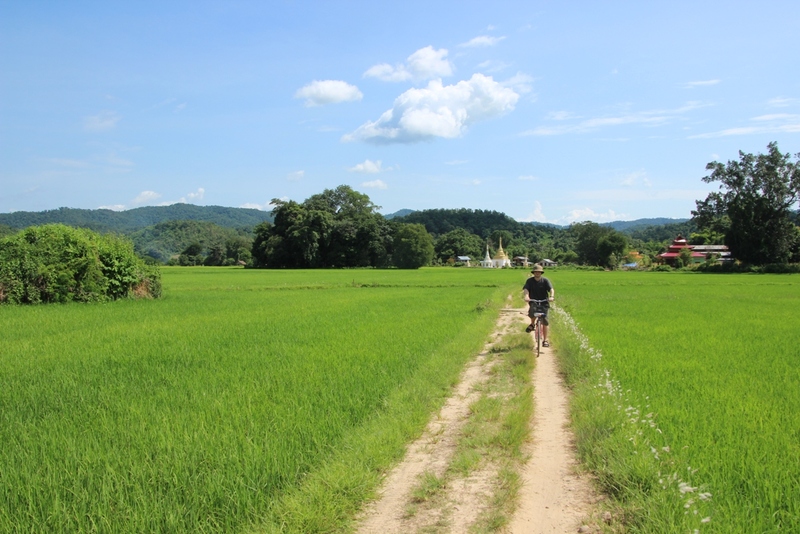 The trail began along a dirt-track road, and then we got lost for an hour or so in some very pretty rice paddies. People had told us that Hsipaw had a cooler climate, but they were lying: it was around 35 degrees Celsius, and very humid. When we finally navigated our way through the jigsaw-like paths which criss-crossed between the rice fields we found ourselves in a small village. It was one of those typical, but nice, Asian farming villages. If you’ve travelled off the beaten track in Asia before, you’ll know the kind; the ones where everyone lives in humble homes and live fairly simplistic lives, but they all seem contented and friendly. 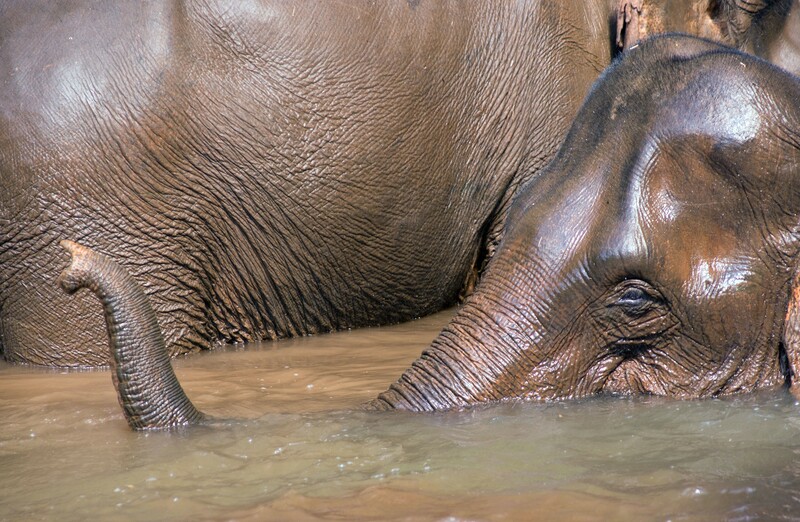 A mother was on the riverbank, in the process of trying to bathe four very fidgety children by lathering them up with soap and then dunking them into the water while they thrashed around, giggling. Roy and I sat in a monastery for a while to shelter from the sun and hydrate ourselves, until we had cooled down enough to brave the footpath again. We then went up a hill, and then down again, eventually passing through a small hamlet which had homes built around the curves of the river. 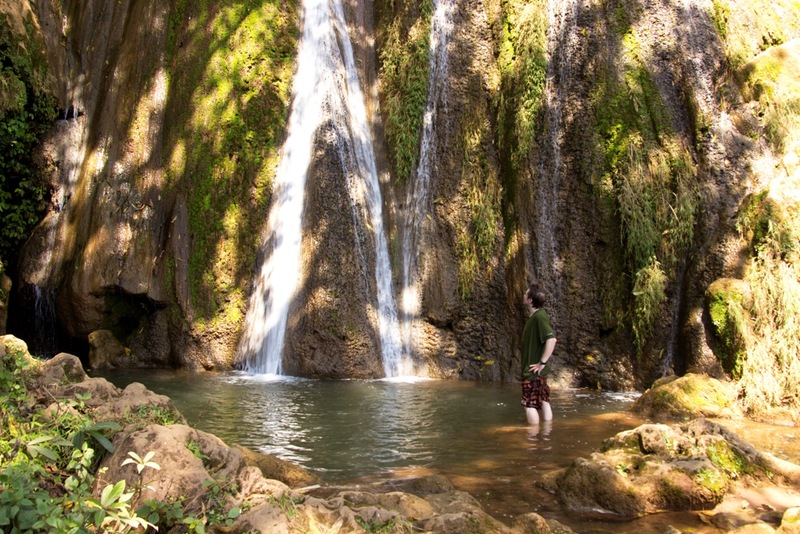 The waterfall itself wasn’t mind-blowing, but it did have a nice pool to swim in one of the tiers halfway up. I ended up sitting at the edge of the tier for an hour or so, enjoying the cool water and the view as I waited for the midday sun to ease. We also went on a short cycling trip the following day, through some of the villages towards the south which were, yet again, very picturesque. 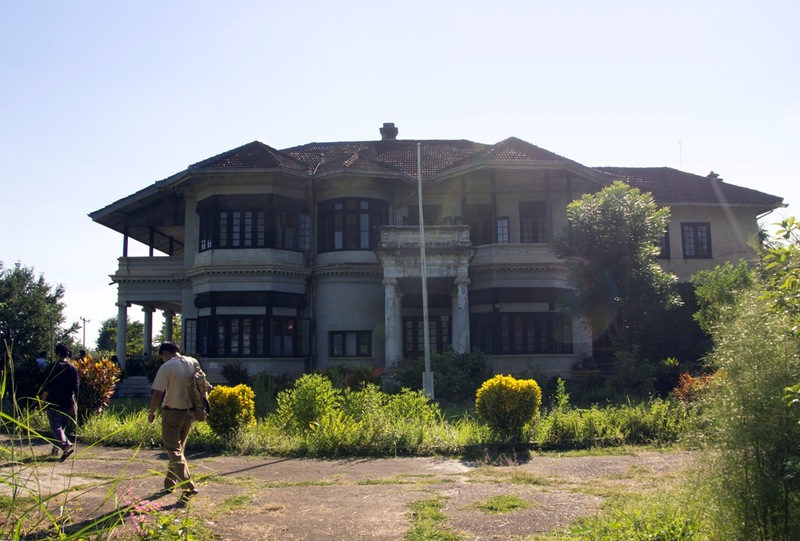 But our most interesting experience in Hsipaw had to be our visit to “The Shan Palace”. Okay, so it is not exactly a palace. The real one was destroyed in the Second World War during air raids. I have seen a few “grand palaces” in Asia, though, and none of them were as interesting as this place. Fern, a middle-aged woman who spoke perfectly accented English, invited us into her house to learn about the Shan Sawbwas (Princes). 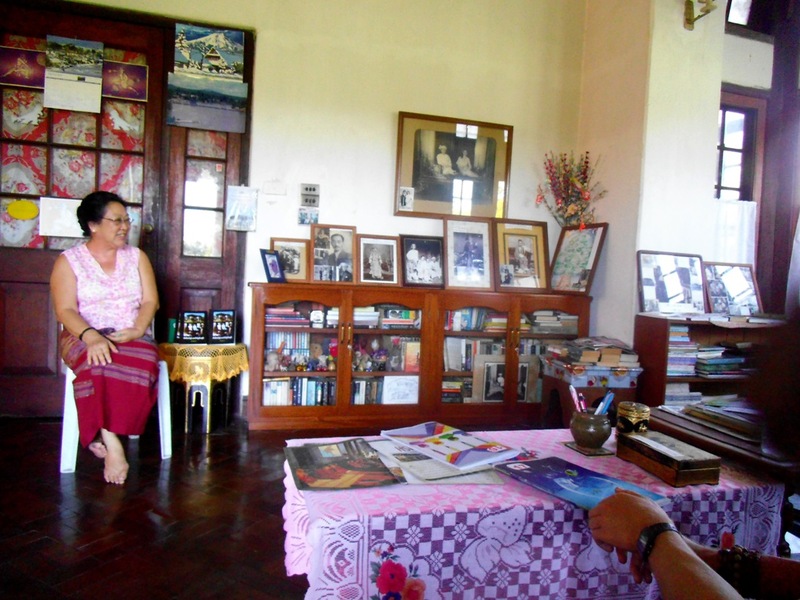 She sat us down and, with the aid of family portraits behind her, told us the story of her husband’s ancestors. About Sao Kya Seng; the last Sawbwa of Hsipaw, who was educated in Oxford University, where fell in love with an Austrian woman and brought her back with him to be his wife, rejecting Shan polygamous traditions. In the past the Sawbwas of Hsipaw were a powerful hand in the administration of the Hsipaw region, even during the days of British colonisation but, shortly after the military coup in 1962, Sao Kya Seng was taken away by the junta and the family fell into decline. 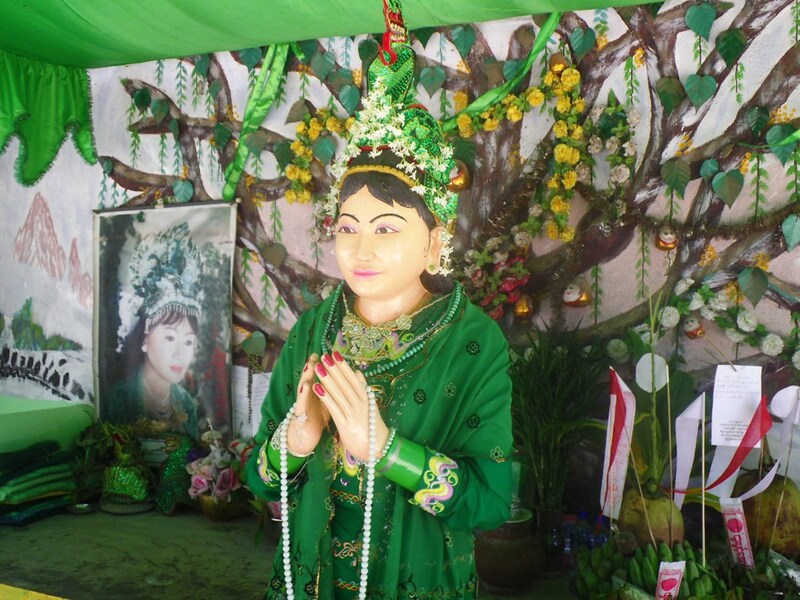 Even today, Sao Kya Seng is officially classed as “missing” by the Myanmar military. Fern’s husband, “Mr Donald”, (Sao Kya Seng’s nephew and would-be-heir) was imprisoned in 2005 for “tourism charges”, but he was released four years later on the condition that he does not communicate with foreign visitors and since then he has been living an inconspicuous life in Taunggyi. His wife has recently reopened their house in Hsipaw so she can continue telling people the tragic story of the Shan princes. She speaks very optimistically about the changes which have happened in Burma since the freeing of Aung San Suu Kyi, and I hope very much that her families’ situation continues to improve.